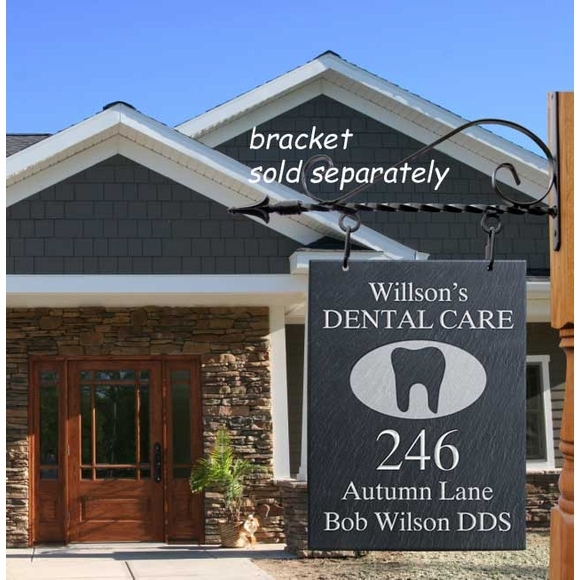 Personalized Hanging Professional Address Sign - - personalized with five lines of text and enhanced with a professional logo for medical offices, accounting firms, dental offices, or legal offices or a decorative arch shape border without a logo. 12" x 16" slate facility information sign is custom made for you. Five design choices: medical logo, accounting logo, dental logo, legal logo, decorative border (see small images for all designs). Line 1 with logo holds up to 12 characters approximately 2" high. Line 1 with decorative arch shape border (option 5) holds up to 5 characters approximately 2.5" high. Line 2 holds up to 15 characters 1.5-2" high. Line 3 with logo holds up to 5 characters approximately 2.5" high. Line 3 with border holds up to 15 characters 1.5-2" high. Line 3 with border holds up to 5 characters 1.5-2" high. Line 4 holds up to 15 characters 1.25" high. Line 5 with logo holds up to 15 characters 1" high. Line 5 with decorative arch shape border holds up to 12 characters 1.25" high. The hanging address sign also comes in a two-sided version (see Related Products).